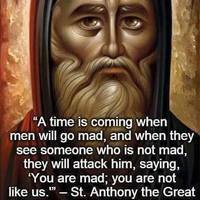 Benedictines don’t opt out or hunker down waiting for an apocalypse. They are simply realistic and understand that when things reach a particular state of societal breakdown, there is an accompanying breakdown in rational discourse and conscientious dialogue. Where there is social anarchy, there is philosophical anarchy. Realizing this, Saint Benedict and his followers down the ages have simply gotten down on their knees, rolled up their sleeves, and gotten to work doing what they can, with what they have, where they are. Without grumbling or being paranoid and apocalyptic… they simply get on with it.